100% hand cut and hand sewn, using high quality leather with skilled craftsmanship. 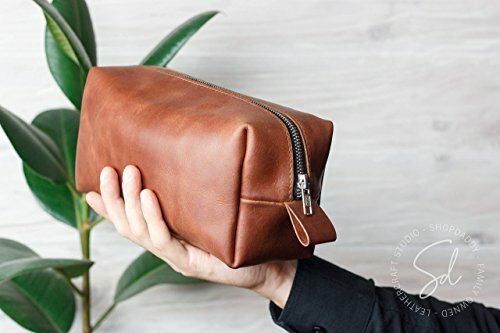 ////// Classical leather dopp kit the perfect gift for any occasion. Really useful thing which will work long time. Genuine leather and strong steel YKK Zipper make this Toiletry Bag timeless. ////// ► Available in different leather colors (Brown color on the photo) ► Genuine leather ► 1 Big compartment ► YKK Zipper ► 2 small straps for easy using zipper ► Personalization options ► ////// This item can be engraved with your initials, name, quote, logo, address etc. FOR FREE! Just let me know and I would be happy to help you with design and any customized ideas. If you have any questions about this product by ShopDaddy, contact us by completing and submitting the form below. If you are looking for a specif part number, please include it with your message.